Jericho Israel challenges the commonly held belief among scholars and historians that the oldest civilizations in the world belong to Egypt and Mesopotamia. Excavations over the last 100 years have produced evidence of habitation off and on since the Mesolithic Age. Archaeologists date excavated remains anywhere from 9,000 B.C. 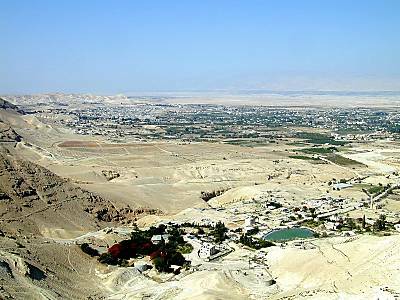 to 7,500 B.C., making Jericho Israel the oldest city in the world, and, arguably, the world's oldest civilization. The site of ancient Jericho, termed Tell es-Sultan by archaeologists, only covers approximately 10 acres, a modest size even in antiquity. Its 70 foot Tell has been cleared to the bedrock, and has revealed over 23 layers of ancient civilization. The ancient city possessed a circumference of one mile. At the time of the conquest by Joshua, it is estimated the population of Jericho was around 2,500 people. Twenty percent of that population would have been available for defense of the city. Tell es-Sultan lies just over 1 mile (2km) from the center of the modern day Jericho Israel, and a mere 18 miles (30km) east of Jerusalem. At 984 feet (300m) below sea level, this city is the lowest in the world. The "wilderness of Jerusalem ", also called the Judean Desert, is 193 square miles (500 km2) of dry desert; uninhabitable land surrounding Jericho. Throughout the centuries, bandits, thieves, outlaws, and freedom fighters sought sanctuary from authorities in this desolate region. Pre-Biblical Ancient Jericho : Before the conquest of Joshua, Jericho had been in existence for thousands of years. Archaeologists have found remains dating back to 9,000 B.C.E., making Jericho perhaps the oldest city in the world. Biblical Ancient City of Jericho : Biblical Jericho appears in stories of cruel brutality and insult throughout the Old Testament. The Walls of Jericho : The walls of Jericho appeared to tower over ten stories above the Israelites below. However, the battle of Jericho was in the hands of God. The Battle of Jericho : Maps provide a detailed look at God's strategy for Joshua and the Israelites in the battle of Jericho. 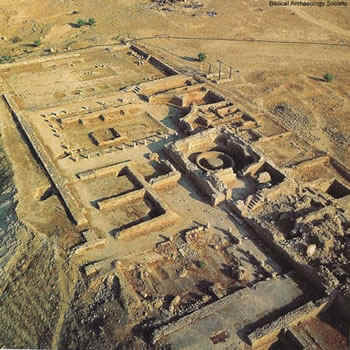 Jericho Archaeology : The city of ancient Jericho Israel has produced many fascinating ruins. The Tell of ancient Jericho has produced over 20 layers of occupied history! Yet, dating of Jericho, specifically the wall of Jericho involved with the conquest, is a much debated topic. I Samuel 23:19 referred to this area as Jeshimon, and it is associated with David's hiding place in the time when King Saul was in pursuit of David's life. Christ's temptation by Satan is said to have taken place in, or near, this region. The city truly is a green oasis amongst desert land. Situated on a narrow plain on the western side of the southern Jordan River Valley, Jericho Israel is a testament to the significance natural resources played in the settlement of cities in the ancient world. "The City of Palms" (Deut. 34:3) is located 10 miles from where the Jordan River pours into the Dead Sea, and just 4 and a half miles from the river itself. It is fed by numerous springs and subterranean wells. The greatest of these springs, named Ein Al-Sultan, puts out an amazing 179,636.99 gallons (680 cubic meters) per hour! The spring, also known as Elisha's Spring, from when he purified it with salt (2 Kings 2:19-22), finds its source in the distant mountains. 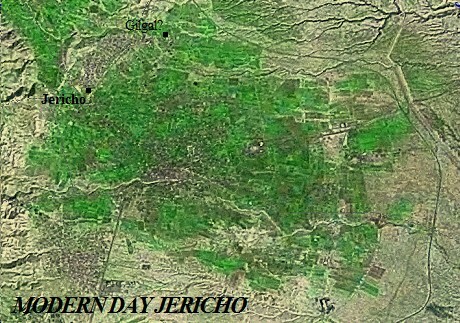 A SATELLITE IMAGE OF MODERN DAY JERICHO. THE JORDAN RIVER IS JUST TO THE EAST OF THE CITY. The other springs are the Nu'meh, Duyuk, Ojah, and the Qelt. These springs, along with Elisha's Spring, provide a constant output of water used just as much for drinking, as it is for agriculture and irrigation. The abundance of water provided very rich and fertile farmland. 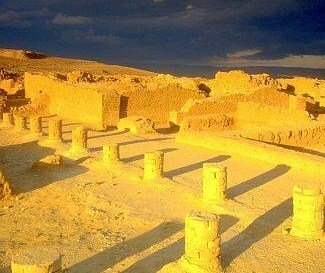 Jericho Israel, or, "The City of Palms", was well known for producing large quantities of dates, which lead to its nickname. ISRAEL ENCAMPED IN ABEL-SHITTIM BEFORE CROSSING THE JORDAN TO ATTACK JERICHO. PRIOR TO THAT, MOSES DIED ON MT. NEBO, IN THE SOUTHEAST, BEFORE ISRAEL CROSSED INTO THE HOLY LAND. Citrus fruits, bananas, flowers, and winter vegetables were also plentiful in Jericho. In fact, the domestication of both plants and animals predated Egypt and Mesopotamia by 1,000 years. 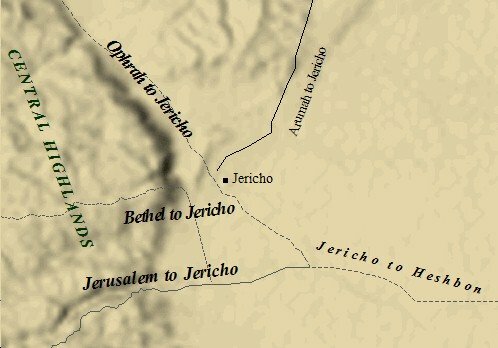 The location of Jericho Israel also played a key role in its longevity. From Jericho, the terrain rises 3,500 feet to the central mountains and Jerusalem in the west. Three routes led from the city to the Central Highlands. This ancient city was the doorway into the heart of Judea, and if Jericho could be taken, then the rest of Judea lay wide open. A key ford of the Jordan connects the Transjordanian Highway and the Medeba Plain in Moab, to the International Coastal Highway in the west, which runs along the coast of the Mediterranean Sea. The ICH was the main artery of traffic throughout ancient Palestine. Jericho controlled this ford, as well as the main north-south route through the Jordan Valley, which led to Beth-shan, an extremely important trade city of antiquity. Just to the east lies "The Kings Highway", mentioned in Numbers 21:22. This road, though not as militarily important as the International Coastal Highway, held enormous economic potential. THE ANCIENT CITY OF JERICHO WAS A DOORWAY INTO CENTRAL CANAAN. ROADS TRAVERSED THE CITY LEADING IN EVERY DIRECTION, BOTH IN AND OUT OF CANAAN. Starting at Ezion-geber, at the tip of the Gulf of Aqabah in the south, The Kings Highway ran nearly 300 miles northward through the Transjordan to Damascus. Caravans carried spices, perfumes, and other goods from the Arabian peninsula along this highway, stopping off at key sites along the way such as, Kirharseth, Dibon, Heshbon, Ramoth-gilead, and other major cities leading to Damascus. The economic significance of this route led to many conflicts between Damascus, Jericho, Israel, and other kingdoms in the Transjordan. In antiquity, The Kings Highway was the main inland route from Egypt to Damascus. Coming from this direction, the most convenient way to enter Canaan was to cross the Jordan River near "The City of Palms". Despite the antiquity of this great city, and its obvious importance throughout history, the only written account of ancient Jericho Israel is found in the Bible. Author Rafael Ruppin dives into some of the most captivating and intriguing documents ever unearthed! BarnesandNoble.com presents The Jericho Scrolls. These 1,900 year old recollections of Julius Antigonos, a Roman Knight and Jewish Leader, shed invaluable light on the history of Israel. These documents were found buried in a leaden chest and sealed with tar from the Dead Sea. The Jericho Scrolls are a must have for fans of the ancient Near East! Click on the book to purchase your copy! Israel-a-history-of.com hopes you enjoy this product offered by our advertisers! Enrich and further your studies with these Study Resources! Please give us your feedback concerning the products offered by clicking on the Contact Us tab on the NavBar. After the death of Solomon the United Monarchy split into two countries, Israel (Samaria) became the Northern Kingdom, and Judah became the Southern Kingdom. Jeroboam would become the first King of Israel. He had fled to Egypt during the reign of Solomon, as his popularity among the people put him in contest with King Solomon. Jeroboam took for himself a bride from the Egyptian royal family, thus, a bond was formed between Egypt and the Northern Kingdom under the leadership of Jeroboam. This bond would become very important in the years following Jeroboam's death. Share Your Thoughts on Jericho Israel. Have you ever visited Jericho? Do you live in Jericho? Share your questions, comments, and thoughts on this ancient city! During the time of the Divided Monarchy, Israel and Judah constantly fluctuated as to which was the more powerful Kingdom. Consequently, alliances also fluctuated, depending on who was the strongest at any given point in time. Ancient Syria was a constant threat to the Northern Kingdom, and often sought alliance with Judah (The Southern Kingdom) in efforts to thwart Israel. The strength of Judah reached its climax after Jehoshaphat defeated the Moabites and Ammonites. As Judah increased its power, it would be natural for Israel to reestablish ties with Egypt, founded during Jeroboam's flight from Solomon, and his preceding rise to the Northern Kingdom throne. It was under Kings Ahab and Ahaziah that Israel sought assistance from Egypt. This alliance was a good counter to the alliance formed by Judah and Syria. Hence, Egyptian presence in Jericho Israel increased as the two countries sought alliance and control over Palestine. Jericho lay within the bounds of the Northern Kingdom, and maintained its strategic importance during this time of shifting loyalties. As a result, one would expect to see an increased Egyptian influence in the region dating from this time. Ahab ruled the Northern Kingdom (again the exact dates differ) from 873-851 B.C. Ahaziah followed him, ruling from 851-849 B.C. It is interesting that Jericho Israel today is under Palestinian control. The modern day city is comprised of 17,000 inhabitants. When the surrounding villages and refugee camps are included, the population is 25,000. The average annual temperature in Jericho is 74 degrees Fahrenheit. The temperature in January is 47 degrees. The highest average annual temperature is 87 degrees. The average annual rainfall is only 5.91 inches, thus, modern day Jericho relies heavily on the surrounding springs, just as the Jericho of ancient times relied on these very same springs. The modern day city of Jericho Israel sits just one and half miles southeast of the ancient site of Jericho. It is a remarkable testament to the antiquity of that region, and the significance that Palestine has played in shaping the history of the world. It is truly a place where the ancient past comes into contact with the immediate present.